"Why do you bathe your adopted kitten weekly?" I asked the couple. "She is adopted. She does not groom her backside after pooping," the husband said. "The cat will clean her backside for her!" The husband held the kitten after bathing her in the kitchen sink. The kitten wriggled and fell onto the floor. 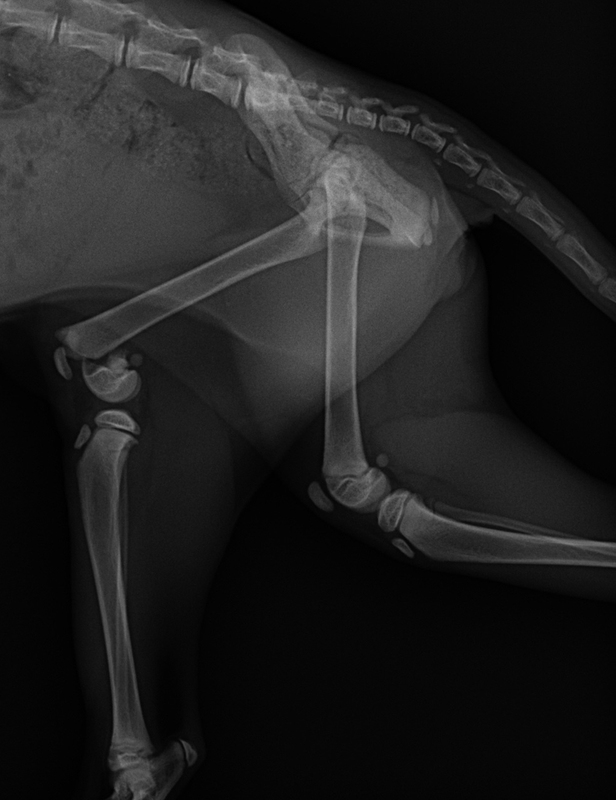 Vet 1 took an x-ray and advised him to go to a vet for surgery to align the broken femoral bone. Video of kitten before op. Best practice is to take X-ray of both limbs for comparison. Sedation is needed. 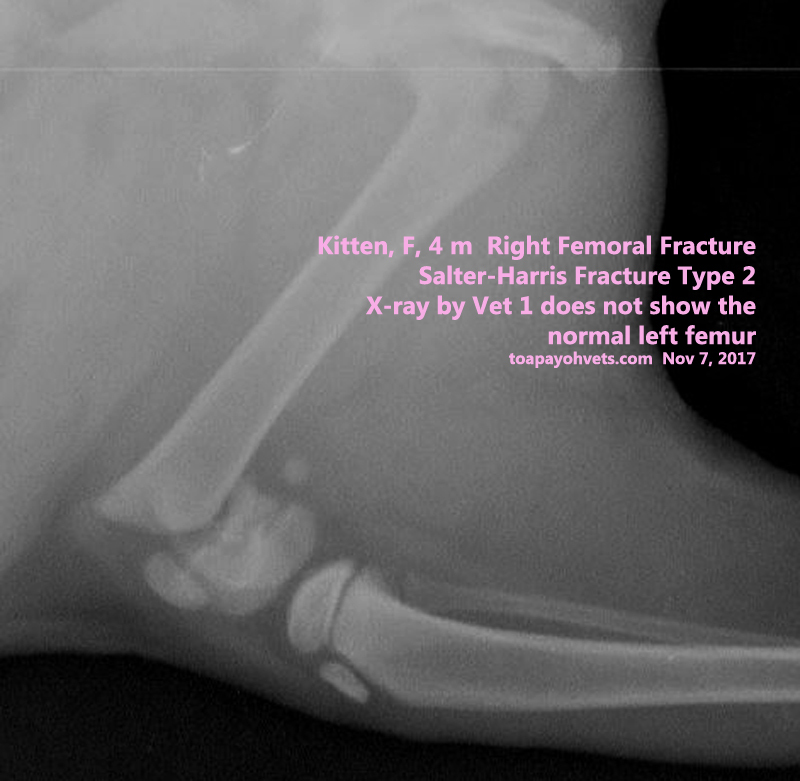 Vet 1 said that the fracture was Type 1 but he was not sure whether it was Type 2. 1. 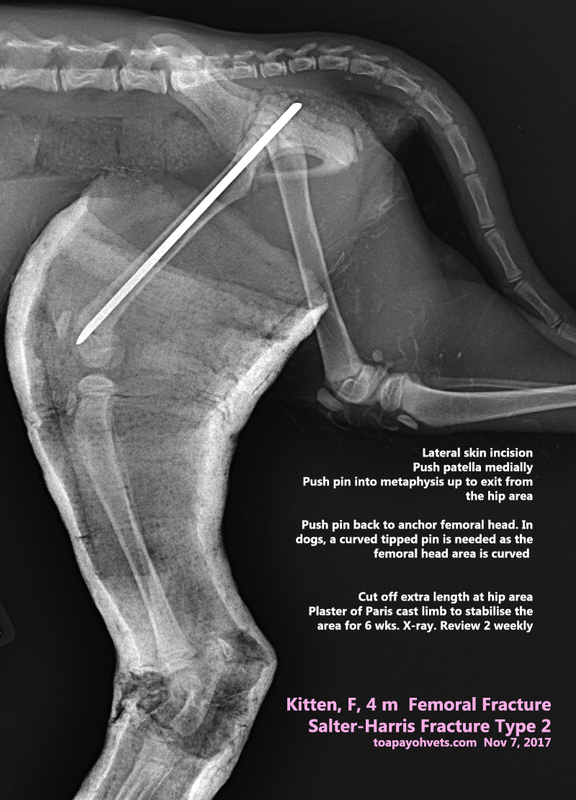 Some vets use short pins to anchor the fractured femoral head to the main shaft. This meant external pins and involvement of the joint. To take out cast in 1 week to check the skin incision wound and replace cast. Cast removal 6 weeks post op. "Will the kitten walk and jump normally 6 weeks later?" the couple asked. 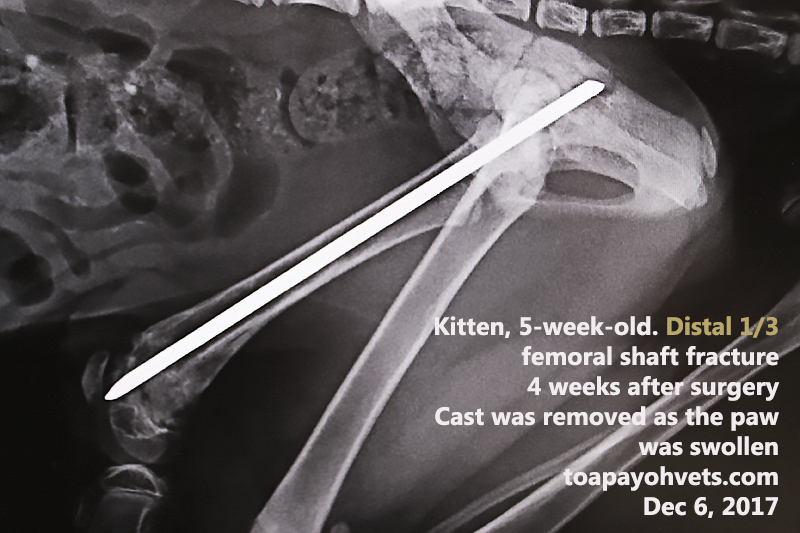 With the cast to immobilise the femoral head part to the shaft, chances are good that there will be union and the kitten will have a normal leg again. Not fully healed. Needs to confine to cage for next 4 weeks. Pin removed after that. 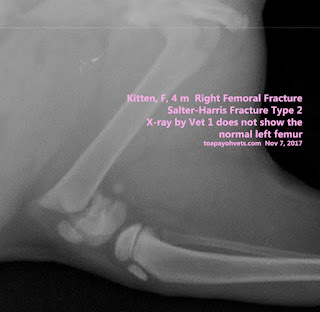 Vet 1 had taken the X-rays twice and advised surgery for the Salter-Harris type 1 or 2 fracture. The owner phoned me the next day, Nov 7, 2017. Surgery was done on the same day. 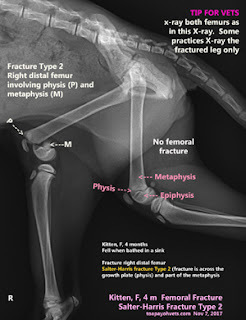 x-ray should include the normal leg for comparison and as best practice. 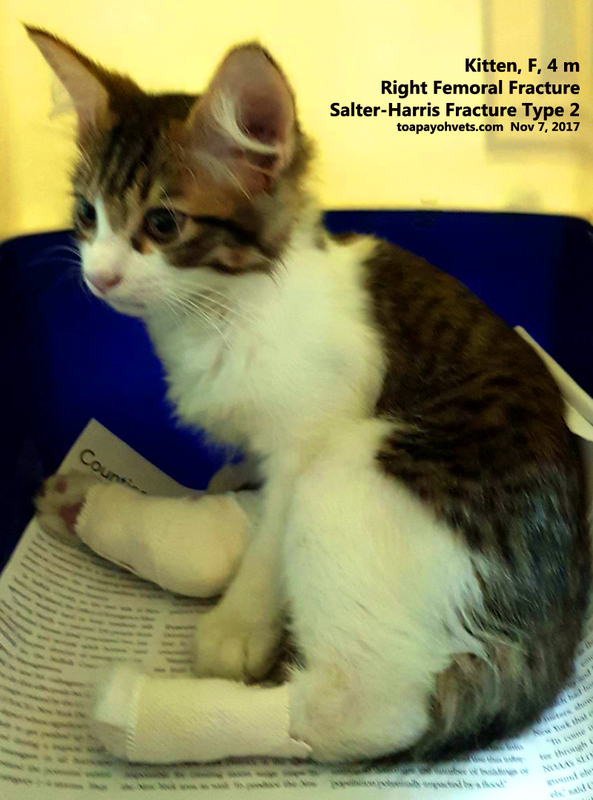 Salter-Harris Type 1 fracture involves only the physis. 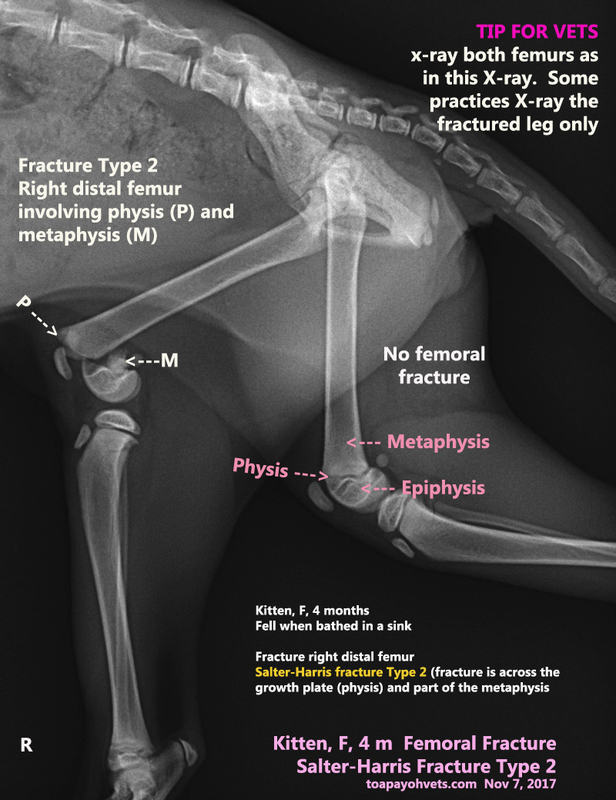 A cast is needed as this fracture near the joint is unstable. 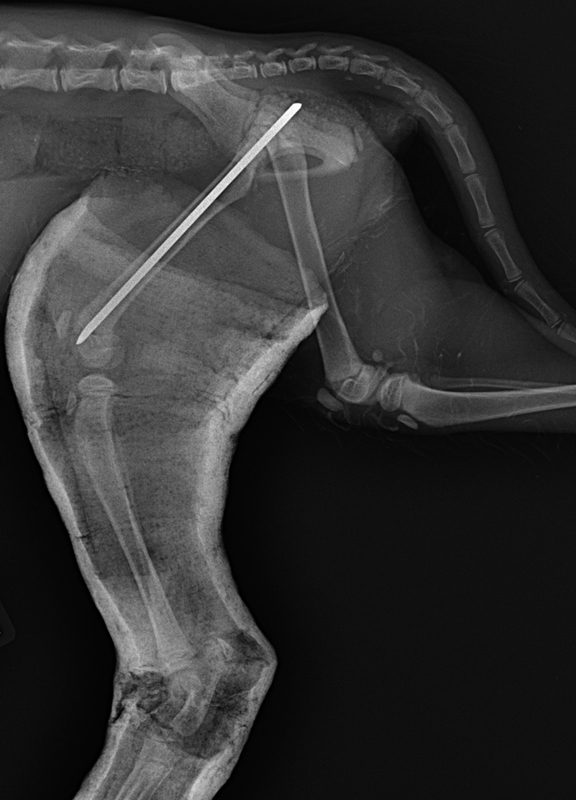 If the fracture is mid-shaft, there will not be any need for casting as the pin will hold the two broken bones together to heal. 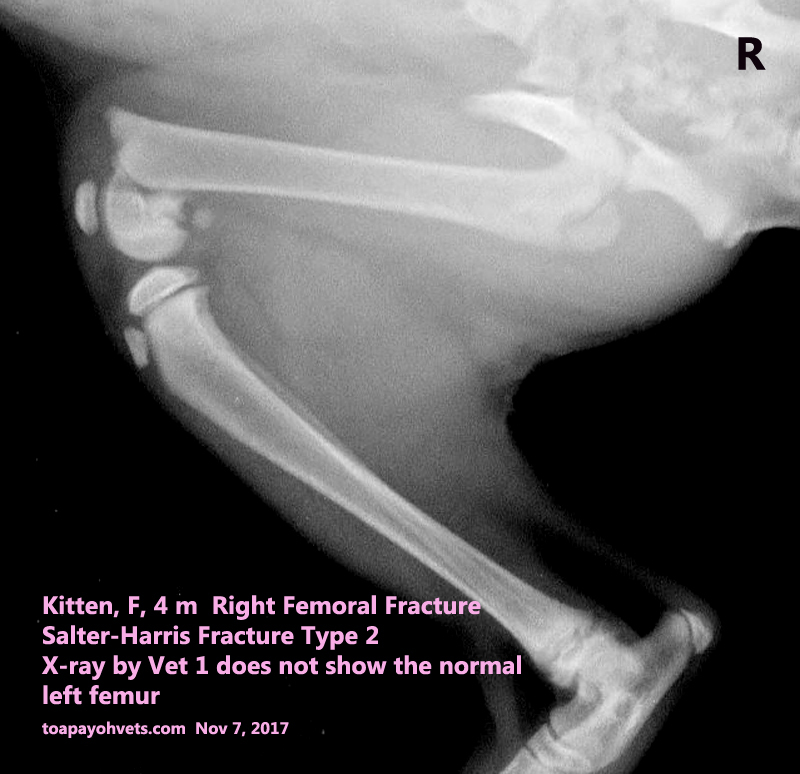 X-rays need two normal femurs to be X-rayed, not only one injured femur as done by Vet 1. Above X-rays done by Vet 1. Only one leg is X-rayed. 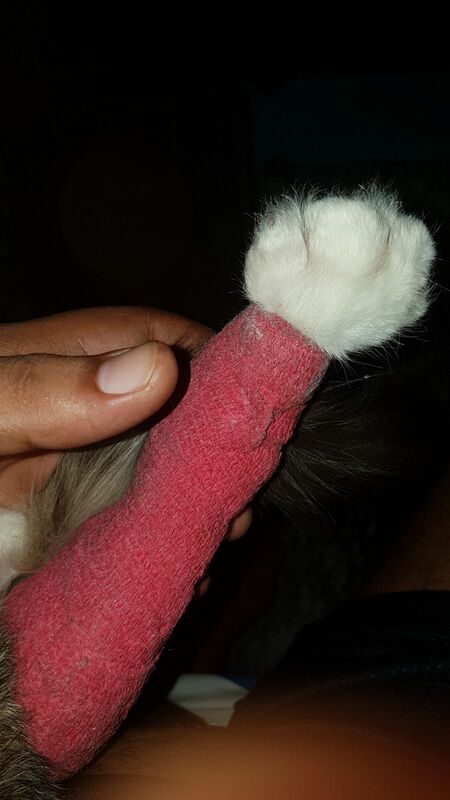 The kitten was in pain and struggling. 6 days of hospitalisation. The left knee incision wound to insert the pin is not infected as there is no bad smell and the kitten is active and eating, pooping and urinating in the litter. See video. 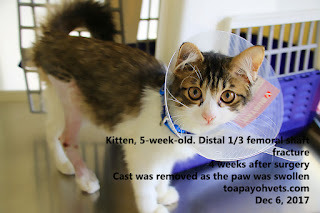 The kitten goes home today, confined in small cage as in Toa Payoh Vets for the next 10 days. The kitten will need to come back for review and the cast taken out for checking whether the skin incision wound is infected or damp under the plaster of paris cast. Strict confinement to the cage for the next 10 days is necessary to prevent movement of the pin away from the femoral head. The paw was swollen suddenly. The owner came. 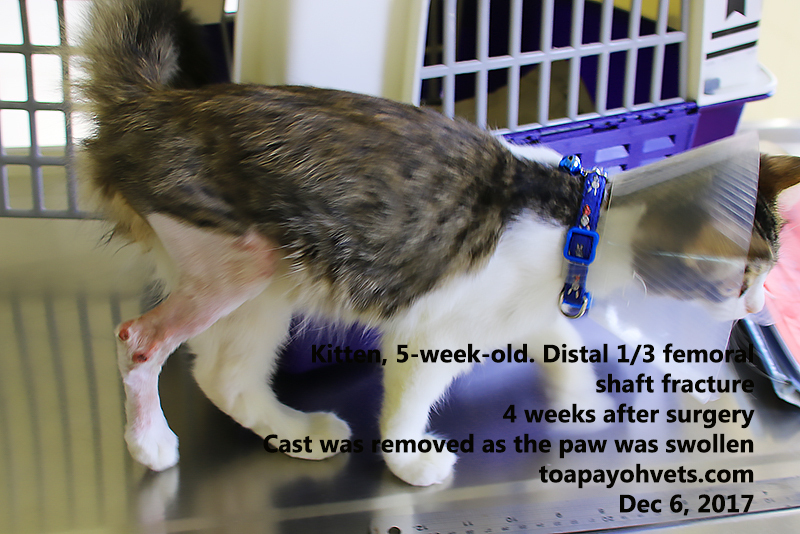 Cast was removed on Dec 5, 2017. X-ray done. Goes home. Confined to crate for another 4 weeks. Pin will be taken out after that.